Incorporating dominant seven arpeggios into your improvised lines is a simple way to expand note-choice possibilities. Skipping certain scale steps can lead to more engaging, less predictable ascending runs. 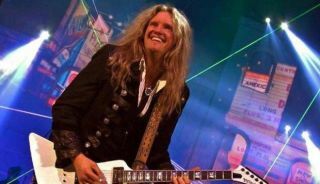 In this brand-new Joel Hoekstra lesson, take a look at rhythm guitar and the incorporation and understanding of suspended chords. Learn how to take a fretboard shape for a given note sequence and “octave mirror” it by “previewing” each note an octave higher. There's a new DVD available at the Guitar World Online Store:Hard Rock Lead Guitar Master Class with Joel Hoekstra. Guitarist Joel Hoekstra on Upcoming Night Ranger Album: "We're Going Back to More of a Vintage Sound"